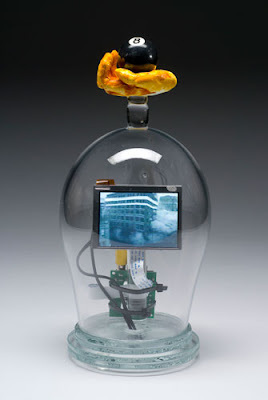 Tim Tate: A Look Into a Video Mind opens at Billy Shire Fine Arts with an opening reception on Saturday, October 11th, from 7-10 pm. This will be Tate's solo debut in Los Angeles. You can see some of the videos online here. As I noted before, last week I juried the current show at the Capitol Hill Arts Workshop in DC, where I looked at about 100 works of art and selected 35 for exhibition and handed out six awards (three honorable mentions). The opening is today, Saturday, Oct. 11 from 5-7PM. I'll be there giving out the awards and also doing a talk with tips to artists on how to improve their chances of getting accepted into juried competitions. The opening and my talk is free and open to the public, so come by and say hi. The Capitol Hill Arts Workshop is located at 545 7th Street, S.E. Washington DC, 20003 (the corner of 7th and G Streets, SE). If you take the Metro, they are two blocks south of the Eastern Market metro plaza, which is on the orange and blue lines. After exiting the metro stop, walk down 7th Street (there’s a CVS on the corner) two blocks, away from Pennsylvania Ave. The Arts Workshop is located at the corners of 7th and G Streets, SE, entrance on 7th Street. Powerful art elicits powerful emotions, and when those emotions are tied to strong political sentiment, it is even more powerful and sometimes dangerous. 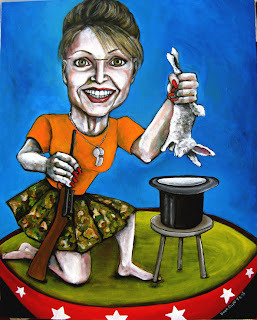 Heather Goss over at DCist relates the story of DC area artist Dana Ellyn and what happened when some of her anti Sarah Palin artwork got exposed to political sentiment in a DC area store. Read it here. Winston Churchill once said that "any man who is under 30, and is not a liberal, has no heart; and any man who is over 30, and is not a conservative, has no brains." Having been both a very dangerous leftwing nut in my young years, and a complacent conservative in my middle years, I am now very happy in my current incarnation as a happy independent, and I am now always puzzled by people who (on both sides of the political spectrum) try to muzzle or interrupt the other side's opinion, such as the idiots in this DCist story or the jerks who crash the other party's convention, or heckle the other politician's rallies, etc. Nations where only one side of the political spectrum is allowed to express their views are called dictatorships: Cuba, North Korea, China, Iran, etc. and more and more Russia and Venezuela. Seattle's Regina Hackett is always one of my favorite reads and she brings up a new movie about one of my old art school professors. Read it here. In my senior year at Washington, I worked with a lady named Dianne Berge and helped to organize a new art gallery just for student artwork. As I recall it opened in either late 1980 or early 1981, and was located on the street behind and underneath the Pike Place Market. It was called the Arts Northwest Student Gallery, and right about the same time Mason moved into the then new condo complex across the street and often came to the gallery's openings and poetry readings. I am the worm at the root, I am the thief in the night. I am the ghost in the hall, herald of horror and hate. Laughing man's labor to scorn, weaving a web for his feet. The rot of the rain by night, the blast of the sun by day. I bring the black plague from the south and the leprosy in from the east. Where the fat black serpents drowse I gather the Upas' blooms. In lost grey fields of rice, I learned from Mongol dead. I have digged in the desert sands to plunder terrible graves. But out of the south or the north, I come with the slavering dead. There was never a man or beast in the blood-black ways I took. There were pits where mad things drummed, and foaming blasphemy. There were clouds like blood-drenched plumes where unborn demons screamed. There were adders in the slime, and a dim unholy Face. From the hells beneath the hells, I bring you my deathly fruits. Somewhere in my studio's flat files I have one or two of his paintings, still unstretched from my moves in the 80s.